Desktop Manager 1.00 free download. 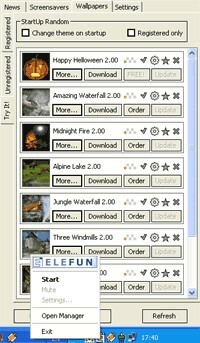 Desktop Manager is a new product from the Elefun Multimedia Company. Desktop Manager is a new product from the Elefun Multimedia Company. It is built into all the new versions of the Screensavers and Animated Wallpapers of the Elefun Multimedia Company. Desktop manager supports products’ navigation, settings, purchase and update. Desktop Manager supports the setting up of already installed products of the Elefun Multimedia Company, enables products’ navigation, setting up general options at discretion, download of the new products and their update. Moreover, it will enable you to get the latest news on the products. TRY IT – enumerates the products already available for installation. You can set up, update, download and purchase a product using a corresponding section, where all the products are enumerated due to their status. You can also use a built in option in order to vote for your favourite product. In addition, DESKTOP MANAGER enables each user to send a commentary on the product to the ELEFUN MULTIMEDIA Company, or to send a message to a friend directly from a corresponding section. OSCPMWin is a multilanguage Windows application to manage the products of your OsCommerce virtual store from your desktop computer. The EleFun Multimedia Company congratulates you with Christmas! As a gift to its users our company has released a new Screen-mate �Christmas Fir�. Live Motion - Animated Screensaver by EleFun Multimedia. Wallpapers Manager will let you create wallpapers lists, as BMP and JPG graphic files - and use them as windows desktop images. Stardock Central is an enhanced download manager which allows users to install and manage Stardock's software products.